Today's guest blog post was written by Nate Thompson, CEO of Cypress, a Brightcove Solutions Partner. Cypress is a Seattle-based digital agency that creates seamless interactive experiences across the web, mobile, tablet, console and connected TV. Cypress combines design and technical expertise to support its clients' varied app development and transmedia strategy development needs. In the last several years, there has been an explosion in the number of devices that consumers use to access video content. While this was initially a very PC-centric activity, the advent of connected, or “smart” devices has significantly increased consumer choice for video consumption, and consumers have taken advantage of this. First with smart phones, and then tablets, video has been a core focus of what consumers use their connected devices to access. Beginning in 2012, however, connected TVs and gaming consoles have seen tremendous growth and consumer adoption. Unlike smart phones and tablets, these devices give consumers the best of both worlds: the vast set of options made available via IP-based video catalogs in addition to the traditional lean-back experience of watching video on the big screen. 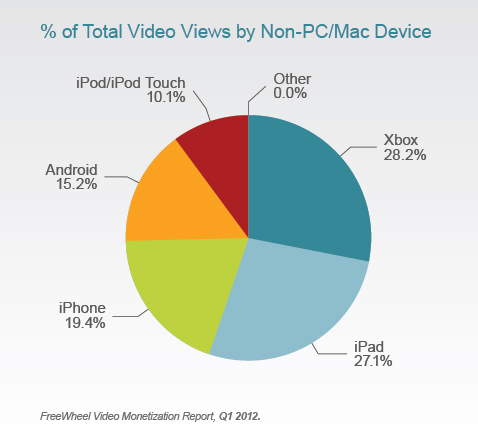 As a result, consumers are watching more and more video through these devices than ever before. One recent entrant to the market that Cypress has focused on, and which Freewheel noted in its Video Monetization Report in Q1 2012 as the #1 non-PC video consumption device, is the Xbox. With a global footprint of over 76 million devices sold, and over 46 million of those being subscribers to the Xbox LIVE service, Xbox has emerged as a leader in consumer video delivery. For its part, Microsoft saw this trend coming as its Xbox users engaged with early video apps such as Netflix and YouTube on the platform. To accelerate the availability of video on Xbox LIVE, Microsoft created the Lakeview program – which, in essence, allows a number of third-party developers to create video applications for the Xbox LIVE platform. As an early mover on the Xbox LIVE Lakeview platform, Cypress has launched a number of the first consumer applications including Sony Crackle and Popcornflix. With several additional apps in the certification process now, and more in the initial planning and design phases, Cypress is placing tremendous emphasis on video application development on the Xbox LIVE platform. In the course of developing these initial apps, Cypress saw an opportunity to drive additional value for our customers on the Xbox platform. To support this, we developed CypressX, a third-party reference application for Xbox LIVE video apps. The core focus of our licensed application is two-fold: to maximize the monetization of video libraries for our media clients, and to lower the Total Cost of Ownership (TCO) of their Xbox app. On the monetization front, Cypress is introducing new advertising and sponsorship units that are not available from the Microsoft reference application for Xbox LIVE applications. Additionally, CypressX will enable timed content previews to entice viewers to authenticate or purchase content via a dynamic paywall. With respect to TCO, the plug-in architecture of CypressX significantly reduces the costs to integrate with Brightcove App Cloud for integration points including user authentication, advertising and analytics. Moreover, changes to the user interface such as navigation and layout that would typically require a title update and certification pass, can now be managed dynamically via Brightcove Video Cloud. With the growing amount of choice on the Xbox platform, as well as the growing number of devices in market – now well over 73 million – Xbox is a platform that media brands can’t afford to ignore. We believe that there are significant opportunities on this platform, and these opportunities are what have guided our development of the new third-party reference application for Xbox LIVE video applications. We are also excited to be partnering with Brightcove on our first joint implementation on the CypressX platform. If you’re attending CES this week, please contact us at x@cypressconsulting.net and we will do our best to find time to meet during the show. If you would just like to learn more, please visit us at www.cypressdoeskillerapps.com/x. Nate Thompson is a digital strategist who has been helping organizations make strategic use of the Web and mobile technologies since 1995, when he started Cosmix Interactive – one of Seattle’s first digital agencies. He sold Cosmix to USWeb in 1997, and continued to run the company’s consulting practice for the Northwest region, leading projects for customers including Boeing, Egghead.com, Microsoft, Nordstrom and Starbucks. In 2001, Nate founded Cypress when he recognized the opportunity to help clients take advantage of the inevitable shift from dynamic content to long-form digital video. Cypress is now a leading digital agency and development firm focused on user experience design, app and product development across the web, mobile and OTT platforms. Cypress was recently named one of the Best Companies to Work for by the Puget Sound Business Journal and Seattle Met. Clients of Cypress include startups, media & entertainment, and Fortune 100 companies such as adidas, Amazon.com, Disney, FOX Broadcasting Company, the National Basketball Association (NBA) and Sony Pictures.